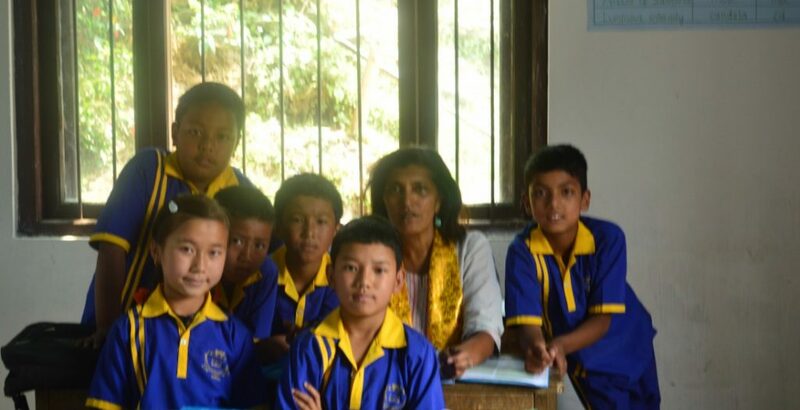 Jayanti, who recently volunteered at Lovebuds School near Kalimpong, tells us about her time teaching at the school and her exciting experiences as a volunteer. Here, she describes getting to know Lovebuds school. What can I say about my time in Munsong teaching at Lovebuds Nursery School except that it has been an absolute pleasure to volunteer there as an English language teacher. The village, evoking a veritable Shangri-La hidden away in the hillside an hour’s drive by shared taxi outside the bustling little town of Kalimpong is one of the prettiest I visited of those dotted around this side of town, surrounded by stunning views of lush green forest and quinine plantations, which has been the dominant livelihood of the villagers for generations. Suren, the headmaster and Anju, his wife were my hosts and did all they could to make my stay comfortable. I adored my little room with its window looking out on to their smallholding that provided them with a supply of essential vegetables and dairy produce. Looking down the descending hillside one could see the neighbouring houses with their own farmed areas around them. Fruit trees abounded, amongst them mango, peach, grapefruit and orange. It was a bird-watcher’s paradise too! As has been acknowledged before the school itself is poorly resourced – scanty stationery supplies, hardly a library to speak of, no provision for extra-curricular activities apart from sports and one faulty computer. There is no office equipment (and hence no school office). Teaching in such an environment therefore, is carried out unassisted by sophisticated teaching materials and primary, traditional methods are used: teachers standing in front of the class and getting students to copy or memorise what is written on the blackboard, or working closely from the text book – indeed text books are the main obvious resource that the children bring with them to school every day. Mondo are working very hard to change this both by helping with infrastructure and improving the standard of teaching.